When previewing a card, I usually take my time before heading into the reveal. I like to provide some context, tease out a bit of the flavor, maybe tell a few jokes. Whoa. Not only is Azor, the Lawbringer an incredibly powerful card, it's a flavor bombshell. Been wondering about the identity of the "Winged Beast," aka the Last Guardian? Me too. I had hoped it would be someone interesting from Magic's past, but I wasn't expecting it to be one of the Multiverse's most mythical figures. Before we get into the nuts and bolts of Azor's art and abilities, let's recap what we know about the character. For starters, Azor is very old and very powerful. He was the parun (founder) of the Azorius Senate, which means that he's been around at least 10,000 years. His résumé is quite impressive, too. He was the author of the original Guildpact—one of the most impressive spells ever cast. Not only did the Guildpact keep the guilds in harmony for ten millennia, it contained a provision for the compact's eventual dissolution. Remember the Implicit Maze from Return to Ravnica? That was Azor's doing, too. In fact, if it weren't for Azor, Jace wouldn't be the Living Guildpact. I have to imagine that those two have a lot to talk about. Does Azor know that the Guildpact collapsed? Would he be willing to run things on Ravnica again? Jace sure seems to be tiring of his bureaucratic duties. 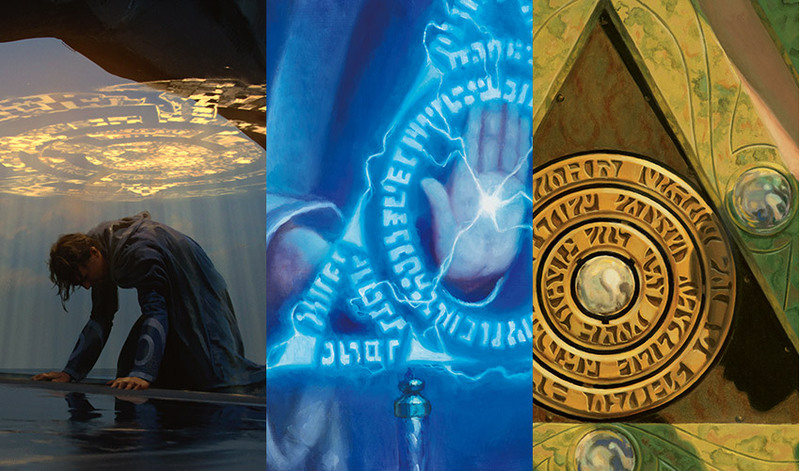 Here's another interesting wrinkle: if you look behind Azor, you'll notice that some of the symbols from Ixalan's Binding, apparently crafted onto some sort of metallic object. This sure looks like the Immortal Sun to me. So did Azor create the Immortal Sun? Was it the other way around, and the Immortal Sun provided the power behind the original Guildpact? Or perhaps the orb has imbued Azor with a set of new powers that we haven't been fully introduced to yet . . . I have to admit, I'd always assumed that Azor was a Planeswalker. His magical abilities are beyond impressive, and the existing lore tells us that he isn't originally from Ravnica. It doesn't seem like he's from Ixalan, either, since we haven't seen any other Sphinxes since we've been here, nor did anyone use the word "Sphinx" when describing him. I also assume that if Azor had the power to travel between planes, he would have taken the Immortal Sun off-world. So how did Azor get here? For that matter, how did he get to Ravnica in the first place? Did he have a Planeswalker traveling companion? Did he lose his spark? Was he trapped here, or has he chosen to say? We know that Azor is at least 10,000 years old, which means that he was around long before the Mending. I'm sure the Immortal Sun plays a role in all of this, but I haven't been able to solve that particular mystery yet. Based on Azor's abilities, it appears as though the Azorius Senate hasn't deviated too far from its founder's principals over the past several millennia. You may recognize Azor's second ability from Sphinx's Revelation, the most iconic Azorius card out there. The Sphinx depicted on Sphinx's Revelation is Isperia, the current leader of the Senate, but I love the idea that this ancient piece of magic has survived for thousands of years and has continued to thrive in Ravnica's modern era. While Azor's first ability doesn't appear on any card I know of, its flavor still feels very Azorius. That guild has never been coy about its desire for control, and Azor, the Lawbringer literally brings the law with him whenever he hits the battlefield. Temporarily stopping others from casting spells feels like the perfect mechanical distillation of what the Azorius Senate is all about, and the ability evokes the sort of personality you'd expect to find in the being behind the creation of the Guildpact and the Implicit Maze. Now that Azor has been revealed, I can't wait to start building decks around him. Commander seems like an obvious first step—as a legendary creature, Azor can command a 100-card deck featuring the major players from the history of the Azorius Senate as well as the spells that best evoke the Azorius ethos of law, order, justice, and bureaucracy. If you can get enough people together, see how well you can do creating and enforcing a "Guildpact" at your own multiplayer table. Try to hold off the fighting for as long as possible by preventing people from casting harmful spells and detaining any creatures that try to start trouble. If you can keep the peace long enough, you win! 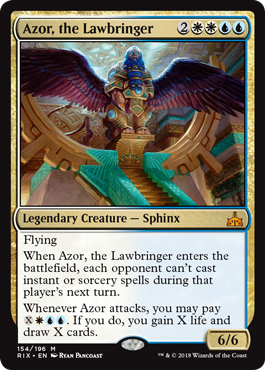 But as excited as I am to unite Azor, the Lawbringer with all my favorite Azorius cards, I'm even more delighted by the mysteries to come. How does Azor fit into the story of Ixalan? We'll all find out together, I suppose. I can't wait!